What can psychology add to our understanding of wine? Universities in Bordeaux, California, the Rhine and South Australia recognise wine as a subject worthy of study, with the production process the focus of most courses. Perhaps more fascinating, from a psychological perspective, are issues such as wine-related sociocultural practices, intoxication, marketing and the meanings we attach to wine. What do we know from cognitive psychology, health psychology, social psychology or neuropsychology? Can psychology help fill the gaps in our knowledge? Wine is a subject which naturally inspires generosity and enthusiasm. There are numerous books and articles on the philosophy, economics, marketing and ‘appreciation’ of wine. Many contain information that could be seen as primarily psychological, but I discovered when researching my new book on the topic that this has never been collated. There is the occasional juicy grape on the vine: Alexandra Woods Logue recently published a third edition of her excellent Psychology of Eating and Drinking with a few pages devoted to wine, and those who scour journals may find the occasional researcher investigating specific aspects, such as taste and smell. But in general, when it comes to a topic that many of us have a personal interest in, the psychology wine glass is not even half full. This article therefore serves as just a brief taster of some areas that might be considered directly or indirectly related to the psychology of wine. I hope that those currently uninterested in wine might reconsider their position, those with a passing interest find themselves more informed, and the already ‘passionate about wine’ find some of the content new to them. Viniculture has had a complex and important role in many cultures, and the history of wine throws up fascinating insights into sociocultural practices. There is evidence of the existence of wine 8000 years ago and archaeochemist Patrick McGovern has found ancient traces of wine in vessels excavated in Egypt, Greece and China. The high acidity and alcohol content of wine preserves organic traces of grape tannins and leaves a record of how these civilisations produced and used wine. In some civilisations commercial and practical applications were primary, whilst in others cultural and religious aspects were at the fore. From the Bacchanal to the Sacrament, wine has had a peculiarly sacred place in human history. Much of this is due to its sensual and intoxicating properties, yet other alcoholic beverages have not achieved the same cultural significance. Early Greek philosophers used wine to stimulate discussion at the Symposium (literal meaning ‘drinking together’). However, this ritual was as much about celebration as philosophical insight. Interestingly, both drunkenness and abstention were seen as problematic in Greco-Roman culture. Demosthenes was derided by political opponents for not drinking wine, and Cicero often accused opponents of drunkenness. On one occasion Cicero charged Mark Antony with vomiting in the senate due to over-indulgence. This caused such scandal that Mark Antony published a pamphlet De ebrietate sua (concerning his drunkenness). However, Pliny then turned this on him by wittily interpreting it as his claim to be the ‘world champion at drinking’. Noah ‘planted a vineyard: And he drank of the wine, and was drunken’ (Genesis 9:20–21). St Cyprian viewed this drunkenness as an allegory for the divine ecstasy of the Eucharist. Indeed Christ’s first miracle was to turn water into wine at the marriage of Cana. Biblical references to wine are numerous, and there is a historical continuity of ambivalence concerning positive aspects of wine consumption and the negative effects of drunkenness. Nothing is so conducive to living an effective life as wine. Do you not see? It is wine-drinkers who make money, clinch their business deals, win their legal cases, become happy and help their friends. Aristophanes’ view of wine is an idealised one, and any responsible psychological perspective acknowledges the health implications of ‘problem drinking’. However, much of the cultural importance of wine can be attributed to its medicinal use. Louis Pasteur called wine ‘the most healthful and most hygienic of beverages’; Hippocrates and Galen used wine medicinally; and the 16th-century physician Paracelsus is attributed as saying ‘wine is a food, a medicine and a poison; it’s just a question of dose’. Contemporary knowledge would support the wisdom of this statement. Paschall and Lipton (2005) examined the relationships between wine preference and health determinants in a large US sample of young adults to improve understanding of the association between light-to-moderate wine consumption and long-term morbidity and mortality risk. Wine drinkers generally had more formal education, better dietary and exercise habits, and more favourable health status indicators (e.g. normal body mass) than other drinkers and non-drinkers. A larger proportion of wine drinkers were ‘light-to-moderate drinkers’ compared to beer or spirit drinkers, and wine drinkers were less likely to report smoking or problem drinking than beer or spirit drinkers. The findings suggest that wine preference in young adulthood is related to educational, health and lifestyle characteristics that may help to explain the association between ‘light-moderate’ wine consumption, morbidity, and mortality risk in later adulthood. Wine contains dietary polyphenols, a diverse group of plant chemicals. One type, procyanidins, seems to have particularly good vascular protective properties. In 1979 Dr Selwyn St Ledger et al. published an article in The Lancet reporting an inverse relationship between wine consumption and deaths from coronary heart disease. Epidemiologists had also reported low rates of heart disease in parts of France despite high consumption of saturated fats. This became known as the ‘French paradox’. Although criticised as an artefact of the way in which deaths were recorded, there is a body of research supporting the view that moderate wine drinking can be part of a ‘healthy’ diet. There appears to be a consistent association between areas of increased longevity and wines with higher levels of procyanidins. Psychologists interested in health matters should look at Professor Corder’s (2007) book on health and wine. However, a synopsis of key advice would include drinking red wine from ‘The Red Zone’ where polyphenol levels are particularly high (e.g. Madiran made from the Tannat grape), in moderation and with food. Younger wine is ‘better’ due to higher tannic content, as is wine with long fermentation and maceration periods and less fining and filtering. For those who choose not to drink alcohol, similar benefits can be gained from eating cranberries and nuts. It might be that the modern move towards an ‘easy drinking, soft and smooth’ style of wine will reduce potential health benefits. These wines are often high in alcohol and low in polyphenols. Thus, look for wines described as tannic and concentrated, with good acidity and ageing potential, that have had minimal processing. These tend to be more challenging for modern palates and are made by winemakers who reject globalisation, homogenisation and modern processing techniques to make wines by more traditional methods. There are ideological battles being fought over wine with ‘old’ versus ‘new world’ value systems, ecological issues and fierce debates over the merits of wine rating scales. These reflect epistemological tensions, such as relativist and positivist positions, as well as discourses related to globalisation and economics. There is a profound ideological divide between those who view wine as a ‘commodity’ and those who attribute metaphysical meanings. American wine writer Robert Parker’s influential rating system originated from a desire to demystify wine and challenge exclusivity. Parker can be seen as representative of an empirical tradition of quantification, and his system could either be seen as a triumph of American pragmatism over French mysticism (see box), or as simplistic and destructive reductionism. As Hugh Johnson observes, ‘the idea that you can score quality is fundamentally strange… I have never seen it tried on works of art’ (quoted in Maclean, 2007, p.122). However, classification systems such as the Aroma Wheel developed by Ann Noble, a Professor of oenology and viticulture, have demonstrated utility and validity by linking the molecular structure of wines with specific aromas such as cardboard and peppers. But what are the consumers really looking for? Author Jay McInerney believes that there is no Platonic notion of perfection with wine and people ‘know what they enjoy and should trust their own taste’. Wine scores are, like most heuristics, a ‘convenient fiction’ that we use to get a grip on a difficult subject. Disraeli’s view – ‘I rather like bad wine…one gets so bored with good wine’ (The Two Nations, 1845) – finds a modern counterpart in Hugh Johnson’s Wine – A Life Uncorked, where he says that he would rather drink a ‘worse’ wine if it has ‘more to say’. This hints at the concept of authenticity, a ‘cornerstone of contemporary marketing practice’ according to Beverland (2006). He looked at 20 ‘ultra-premium’ wineries and interviewed wine drinkers; he identified six key attributes of authenticity: heritage and pedigree, stylistic consistency, quality commitments, relationship to place, method of production and downplaying of commercial motives. These attributes resonated with consumers but were both ‘real and stylized versions of the truth’. Perhaps, for all the talk of wine being an expression of the ‘terroir’ – place (soil, weather, etc.) and culture (history, process, etc.) in which it is produced – we tend to just judge a wine by its cover. Professor Larry Lockshin found the average decision time for wine consumers to decide which bottle to buy is 38 seconds, and decisions are mainly influenced by the label. Makers are therefore producing accessibly named wines such as ‘Good Red’ and ‘Rude Boy Chardonnay’ or bottles illustrated with celebrities they want to associate with the wine. Many psychoactive substances have been associated with creativity, and ancient Persians are reported to have used wine to facilitate decision making. An issue would be explored whilst intoxicated and, the next day, the conclusions that stood up to sober scrutiny were adopted. Some psychologists have demonstrated associations between music played in retail outlets and subsequent wine purchases. Playing classical or pop music does not influence the amount of wine purchased but appears to influence the average price of bottles selected, with classical music leading to sales of more expensive wines (Areni & Kim, 1993). It also appears that playing French or German music influences selections, with more purchases of wines from the same origin as the music (North et al., 1999). It seems obvious to state that the colour of a wine influences our perception of it: colour depth is an accepted, learned association, quality indicator for red wines and many tasters now use black glasses to minimise such effects. Osterbauer et al. (2005) report an fMRI study exploring why it is that colour has such a strong effect on olfaction. For example, adding an odourless red dye to white wine has been shown to fool even Masters of Wine into describing ‘nose’ in terms reserved for red wines. These effects are not simply due to context or expectation. Colour can modify the response to an odour directly in the primary olfactory cortex, actually changing the way we perceive a fragrance. Thus, a blue wine might not only look ‘funny’, but would also smell strange. 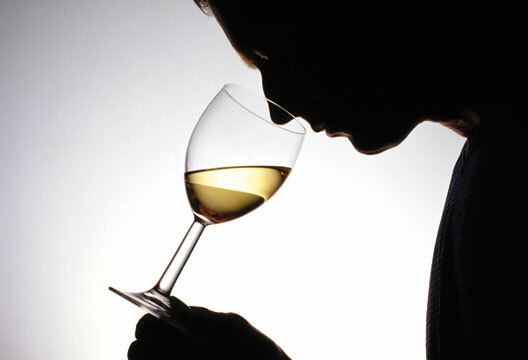 Sebastian Payne, Chief Wine Buyer for the Wine Society, is fascinated by ‘the way smell, like music, goes straight to the part of the brain that stimulates emotions rather than the part that controls our speech’ meaning that aromas tend to be recognised ‘instinctively’ but are hard to describe, perhaps accounting for the ‘purple prose’ of tasters. Information processed by other senses goes to the hypothalamus and cortex for analysis. Adrienne Lehrer (1983), a linguistics professor at University of Arizona, has explored metaphors applied to wine. These are generally ‘enriching’ in language terms, but perhaps the trend is becoming ridiculous when comparisons are made between a wine and ‘Naomi Campbell in latex’. Indeed, trying to describe the wine might actually affect your taste experience, unless you really know what you’re talking about. Melcher and Schooler (1996) found that non-experts were up there with experts in sampling wines and then identifying them from a selection, unless they had tried to verbally describe the wine between the first and second tasting. They concluded that verbalising undermined performance in less expert tasters. Hughson and Boakes (2001) reviewed experimental studies of wine expertise and found that ‘expert performance’ may rely heavily on explicit knowledge. Many experts are able to discriminate between, and match, sets of wines that novices find indistinguishable. What basis might such expertise have in the brain? Castriota-Scanderberg and colleagues (2005) set out to investigate, using fMRI to study sommeliers and ‘control subjects’ to test the hypothesis that any difference in brain activity would reflect a learned ability to integrate information from gustatory and olfactory senses with past experience. Analysis showed activation of a cerebral network involving the left insula and adjoining orbito-frontal cortex in sommeliers. Both these areas have been implicated in gustatory/olfactory integration in primates. In addition, activation was found bilaterally in the dorsolateral prefrontal cortex, which is implicated in high-level cognitive processes, such as working memory and selection of behavioural strategies. Naive individuals activated the primary gustatory cortex and brain areas, including the amygdala, implicated in emotional processing. Brain scanning is also shedding light on how factors which are extrinsic to the wine itself can impact upon our perceptions of it. Plassman et al. (2008) used fMRI to monitor changes in the medial orbito-frontal cortex when participants were given wines, told that they had different costs – $5, $10, $35, $45 or $90 – and asked to comment on how pleasurable each was. Despite real cost, participants rated the wines labelled with higher prices as more pleasurable. The fRMI data appears to show ‘real’ increased pleasure despite wines being identical. As for personal preferences, psychologists are well placed to consider the complex set of variables involved: genetic (Vietnamese tasters do not separate fruit and flower aromas in the same way as French and Americans); environmental (variations in salivary enzymes can also affect aftertaste and impact on individual perceptions) and contextual (a wonderful wine on holiday may taste dull on the return home). Wine means a great deal to the people whose livelihoods depend on it, and producing wine comes with stresses common to other professions subject to the whims of nature and economics. The suicide rate among winemakers in the Languedoc-Roussillon is a cause of concern and in June last year CRAV (Comité Régional d’Action Viticole – regional winegrowers’ action committee) threatened direct action if the French President Nicolas Sarkozy does not take measures to help wine growers in the region. One Montpellier journalist quoted by The Observer linked this struggle to resistance to globalisation and an expression of provincial independence. Psychological knowledge regarding stress management, the epidemiological nature of suicide and the nature of protest are relevant. Other ‘big’ issues in the world of wine include climate change, and acceptable levels of alcohol consumption, perhaps particularly amongst the ‘middle classes’. Psychologists may be uniquely placed to offer insights on a range of wine-related issues, and to help ensure that drinking is managed effectively. Hopefully, we can do this whilst understanding and enjoying wine and the social and health benefits that can be associated with it. Lalou Bize Leroy, a Burgundian winemaker, has a rallying call of ‘Respectez le terre!’ ‘I hate technology,’ she says, ‘it produces fake wines’ (in Maclean, 2007, p.30). She views vine roots, somewhat anthropomorphically, as brains. She recounts stories of her vines ‘withdrawing’ from chemical dependency when switched to a biodynamic approach, created by the Austrian ‘anthroposophist’ Rudolph Steiner in 1924. Steiner believed that agriculture should be in harmony with natural systems such as lunar cycles, for example by filling a cow’s horn with manure and then burying it amongst vines until the spring solstice. Many psychologists might find such an approach contrary to ‘scientific’ understanding, but might also recognise the importance of studying such phenomena. Areni, C.S. & Kim, D. (1993). The influence of background music on behaviour: Classical versus top-forty music in a wine store. Advances in Consumer Research, 20, 336–340. Beverland, M. (2006). The ‘real thing’: Branding authenticity in the luxury wine trade. Journal of Business Research 59, 2, 251–258. Castriota-Scanderberg et al. (2005). The appreciation of wine sommeliers: A functional magnetic resonance study of sensory integration. Neuroimage, 25, 570–578. Corder, R. (2007). The wine diet. London: Sphere. Hughson, A.L. & Boakes, R.A. (2001). Perceptual and cognitive aspects of wine expertise. Australian Journal of Psychology, 53, 103–108. Lehrer, A. (1983). Wine and conversation. Bloomington, IN: Indiana Uni Press. Logue, A. (2006). The psychology of eating and drinking (3rd edn). London: Brunner-Routledge. Maclean, N. (2007). Red, white and drunk all over. London: Bloomsbury. Melcher, J.M. & Schooler, J.W. (1996). The misremembrance of wines past:?Verbal and perceptual expertise differentially mediate verbal overshadowing of taste memory. Journal of Memory and Language, 35, 231–245. North, A.C., Hargreaves, D.J. & McKendrick, J. (1999). The influence of in-store music on wine selections. Journal of Applied Psychology, 84, 271–276. Osterbauer, R.A., Matthews, P.M., Jenkinson, M. et al. (2005). The color of scents: Chromatic stimuli modulate odor responses in the human brain. Journal of Neurophysiology, 93, 3434–3441. Paschall, M. & Lipton, R. (2005). Wine preference and related health determinants in a US national sample of young adults. Drug and Alcohol Dependency, 78, 339–344. Robinson, J. (2006). The Oxford companion to wine (3rd edn). Oxford: Oxford University Press. St Leger, A.S., Cochrane, A.L. & Moore, F. (1979). Factors associated with cardiac mortality in developed countries with particular reference to consumption of wine. The Lancet, 1, 1017–1020.